Thank you for sharing feedback on your experience with 50 Floor. We are aware of your concerns and sincerely apologize for all inconveniences you have experienced. Please understand that what you have described is not a normal practice for 50 Floor or our customers to experience. Your local office has taken the necessary steps to address your matters and our overall goal as a company is to make sure you are completely satisfied as our customer. You will also receive a follow up call to discuss further your matters . 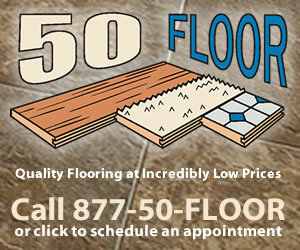 Thank you once again for your feedback and for choosing 50 Floor for your flooring needs. Typical sales experience (you have to purchase today because this sale is ending). No big deal, all the big flooring outfits use this method, no harm, no foul here. Had to reschedule installation because of a business trip. Could not get ahold of my representative after leaving a message that we had to reschedule. I finally called him and he apologized for not confirming. Had not heard any sort of verification until I called to see if they were still coming the night before. The lady in the Atlanta office said the scheduler for my area had left for the night. She went above and beyond to find my order and indeed confirmed that we were scheduled for carpet and vinyl the next day (Friday, November 17th). The installers called in the morning and said they were on the way. The installers came, but it was only the vinyl guys. They said the carpet crew was on their way. At 3:30, after calling the scheduling all day without an answer, I finally got ahold of Erica. She directed me (for the first time in the entire process) to Tony, our local scheduler. Tony informed me that the carpet crew was scheduled to come Saturday -- this was the first I had heard this -- OK, all Saturday plans cancelled to be there for the carpet guys. They are here now, doing a fine job. Next problem, the salesman measured wrong and they are going to be 12 feet short. So now we have to live with half our house packed in our garage through the Thanksgiving holiday until the rest of the carpet can be re-ordered/scheduled to be installed. I took 2 days off of work to have our house ready, We disassembled furniture, changed schedules and have been totally mis/uncommunicated with throughout this process. Very disappointed and will be requesting some sort of refund/compensation for the numerous dropped balls throughout this process. I liked: Quality of products. I didn't like: Nonexistent communication. Review #1133410 is a subjective opinion of User1133410.